Scilly is heaven for windsurfing. 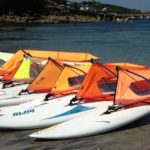 Sheltered bays of clean water with soft sand beaches and virtually no one else on the water makes the Isles of Scilly an excellent place to learn how to windsurf. For intermediate and advance windsurfers the conditions are amazing, blasting from island to island over crystal clear waters. Scilly offers a variety of conditions to sail, predominately bump and jump or flat-water speed sailing. When the conditions aren’t right to sail from our main centre we load up the ribs and head to the other islands to find the best conditions. Like all of our watersports training and instruction, windsurfing lessons can be tailored to suit your individual needs. We have a flexible range of courses and lessons, including private one-to-one tuition, one or two hour sessions or group courses. Our taster session is designed to get you up and going as quickly as possible. We offer 1 or 2 hour taster sessions. By the end of this lesson, the aim is to be on the water more than you are in it. This course will introduce you to the basics of windsurfing to get you up and sailing around as quickly as possible, with no previous experience required. By the end of the course you will be able to sail to a chosen point and return to where you started in light winds. This is the first step in the RYA’s Fastfwd coaching scheme and will build on your previous skills to make your windsurfing faster and more fluid. You’ll try new windsurfing techniques such as beach starts and receive an introduction to harness work to get you ready to start blasting.